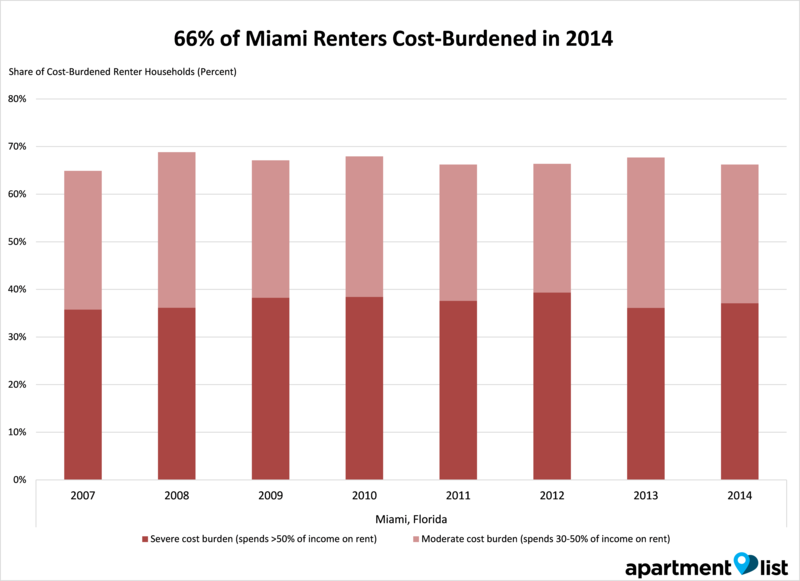 66 percent of renters in Miami in 2014 are considered to be cost-burden, which is well-above the state and national averages. Miami rents increased 17 percent between 2007 and 2014. Apartment affordability has come down only slightly from 2008 when cost-burden renters were at 69 percent. With the US homeownership rate at its lowest since 1967, the U.S. renter population is the largest it has ever been, and now stands at 43 million households. With rents increasing much faster than incomes, however, renters in cities across the U.S. increasingly struggle with housing affordability. Apartment List recently analyzed Census data from 2007-2014 to understand which cities and states have the most cost-burdened renters (spending more than 30 percent of their income in rent). As seen from the chart above, the share of cost-burdened renters in Miami was 65 percent in 2007. It rose to a high of 69 percent in 2008, before falling to 66 percent in 2014. This is significantly higher than both the national (52 percent) and state (58 percent) average. 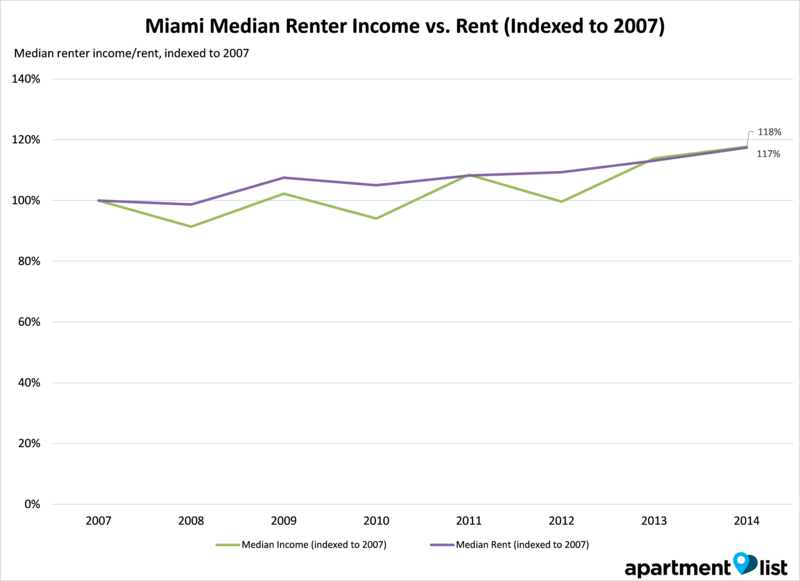 Diving deeper into the data, we see that Miami rents have increased from 2007-2014. Median renter incomes have mostly kept pace, however, increasing by 17 percent during that same period. As a result, the share of cost-burdened renters have fallen back around 2007 levels, but they are still significantly higher than the national level.